This is barely a recipe, they are that easy! You can find numerous recipes for homemade Reese’s all over the internet. I followed The Recipe Critics formula. Simply combine smooth peanut butter, powdered sugar, melted butter and a small amount of milk. Mix on low speed with a paddle attachment, the dough will be crumbly and that is ok! Pull the dough together on a floured board and roll out to, roughly, 1/2 inch thickness. 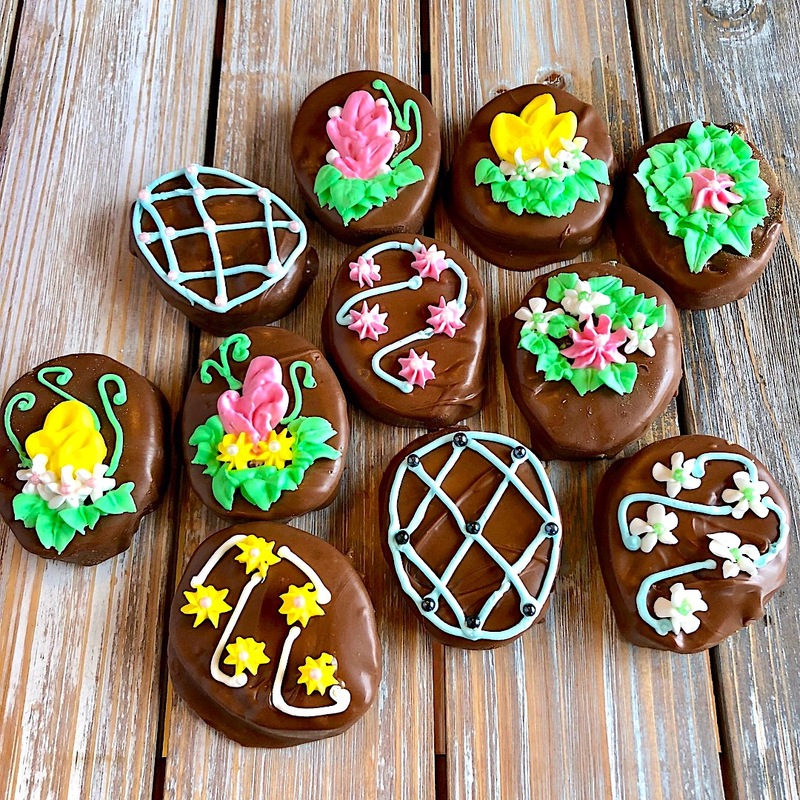 Use an egg shaped cutter to stamp out the shapes. I didn’t have one, so I made templates out of parchment paper. I traced around the circumference of a large egg and cut out the patterns. I then used the templates, and a sharp knife, to make the peanut butter eggs. The eggs need to be refrigerated for, at least an hour. This will help with the chocolate dipping process. Melt 1 bag of milk chocolate chips with 1 Tablespoon of shortening. The shortening will give the eggs a nice shine. I used a fork to submerge the eggs into the chocolate. I did have to use a second bag of chips to have enough chocolate coating for 21 eggs. Honestly, you could stop right here and devour these after the chocolate sets. There is no shame in that 😋 Your family and friends would be thrilled with them, just as they are! This is a giant Reese’s Cup! If you want to go the extra step, this is how I decorated my eggs. I used a royal icing recipe that makes a firm consistency. Some royal icing formulas are soft and have a marshmallow type texture. Delicious, to be sure, but those won’t hold the definition of the piping tips particularly well. You will have softer lines, like the leaves in this picture. I like Antonia74’s recipe for this project. It is still tasty, but with a stronger consistency. I made a batch, divided it up and started coloring! The icing was bagged up, with a variety of flower tips, and I was ready to go. I like to use disposable bags with coupler attachments. I can then change my flower tips to make different colored flowers, lines and flower petals. It may take a few tries for you to get the look you want. I tend to practice a few times on my cutting board or parchment paper to see how the flowers will look before moving to the eggs. If you do make a mistake, not big deal! Wait for the icing to dry and pop it off the surface of the chocolate! This is a better example of leaves with the details I wanted. See the veins in the leaves? As I said before, if you don’t have the time for all the decorating, just eat them plain! I want to wish you all a Happy Easter🐰🐥💕! Dip each egg in chocolate. I used a fork to help cover in the chocolate. Place them on parchment paper to set. In a mixing bowl, pour in the warm water and the meringue powder. Mix it with a whisk by hand until it is frothy and thickened…about 30 seconds. Pour in all the powdered sugar at once and place the bowl on the mixer. When the icing is just sitting on the counter, be sure to cover the bowl with a dampened tea-towel or paper towel, to prevent crusting and drying. Tint with food coloring* or thin the icing with small amounts of warm water to reach the desired consistency. *I prefer gel colors so they will not change the consistency of the icing, and the colors are more intense. omg these look soo delicious. must make these this weekend. You never cease to amaze me. How do you know exactly what I like? It’s as if you have cookie/candy radar! If I made these I’d eat the whole batch in a day. Oh my, the decorations are amazing, too. Nom nom nom! You are whether you know it or not. Your interests are diverse and your skills are many. You’re a renaissance woman! Wow! They really look awesome! I liked how resourceful you were about the egg shaped cutters. Way to think outside the box. These are beautiful!! Your decorating is just perfect. Happy Easter! These are beautiful!! and I LOVE peanut butter anything 🙂 Gonna have to make some -thanks for sharing the recipe. This looks so pretty and shows what a skilled artist you are! Have a nice Easter weekend! Oh yum!! I didn’t realize the recipes were simple. They look beautiful! I know my family would be tempted to steal them before they were decorated. 😉 I hope you all have a lovely Easter! Happy Easter to you Dee. I just put on 5 pounds reading this delicious post.